Genuine Toyota Air Filters are made with triple-layer filter element that traps contaminants before they can reach the engine. A solid polyurethane resin frame helps reduce vibration noise. Your vehicle’s maintenance schedule included recommended inspection and replacement intervals. If you drive in harsh conditions, you may need to change your air filter more frequently. Changing your engine’s air filter regularly is an easy, inexpensive way to prolong engine life and optimize fuel economy. 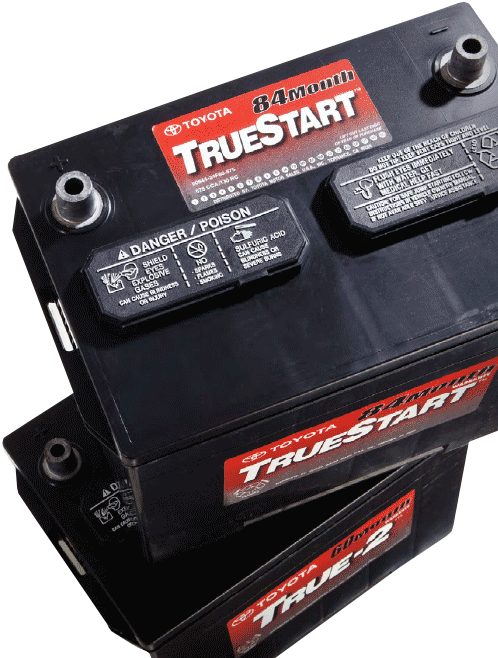 Whether you’re headed down the street or across the country, Toyota’s TrueStart™ and True-2™ batteries are built to Toyota’s high quality standards. They are designed to start in extreme weather conditions and maintain power to electronics during an electrical system outage or long periods of inactivity. Heat, inactivity and frequent short trips can reduce battery life expectancy. If your Toyota starts slowly after inactivity, have your battery inspected. 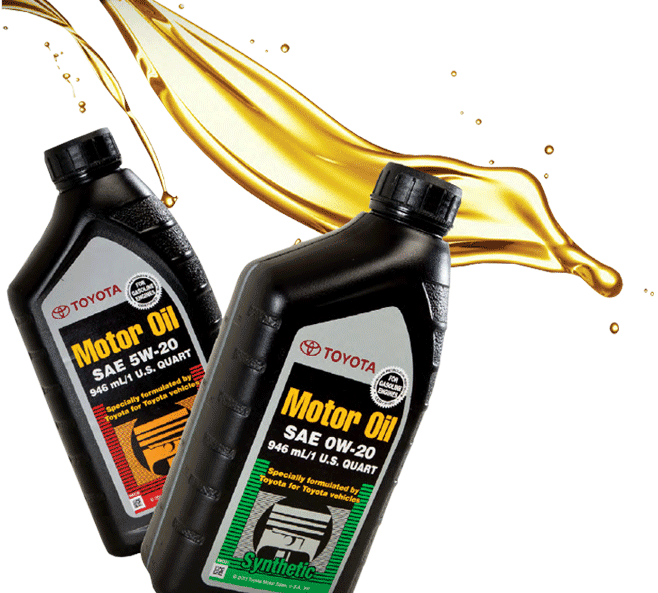 Motor oil reduces friction between moving parts in your engine and helps keep things cool. Following the suggested service schedule for your Toyota can enhance fuel efficiency and extend engine life. 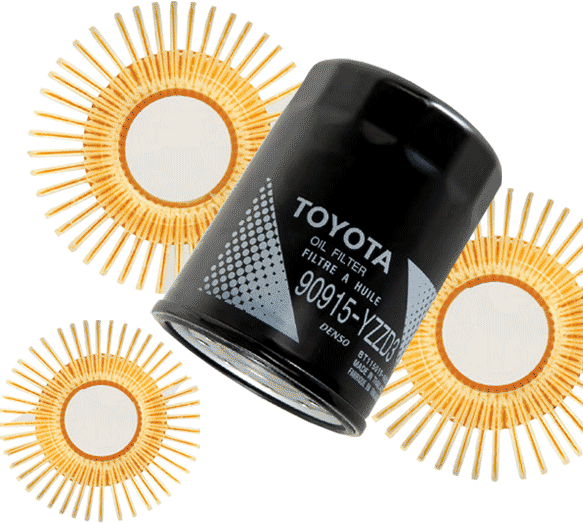 Genuine Toyota Oil Filters help remove dirt and other impurities from engine oil before they have the potential to cause excessive wear. They feature and anti-drainback valve, which is critical to protecting your engine from wear during cold starts. Protect your vehicle and help maintain optimum engine performance and fuel economy by following the recommended oil filter change schedule. The oil filter is your engine’s main defense against abrasion and premature wear. Don’t feel helpless when the truck in front of you is belching exhaust. Genuine Toyota Cabin Air Filters capture unwanted particles so you can take a deep breath. Standard Genuine Toyota Cabin Air Filter – made of high-quality non-woven fabric. 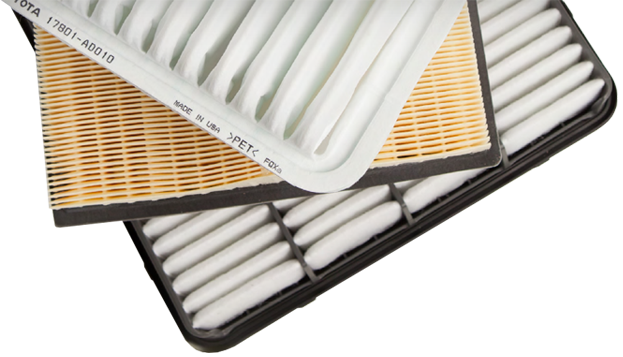 Premium Genuine Toyota Cabin Air Filter – made of the same high-quality materials as the standard filter, plus a layer of activated charcoal to help remove unpleasant odors. 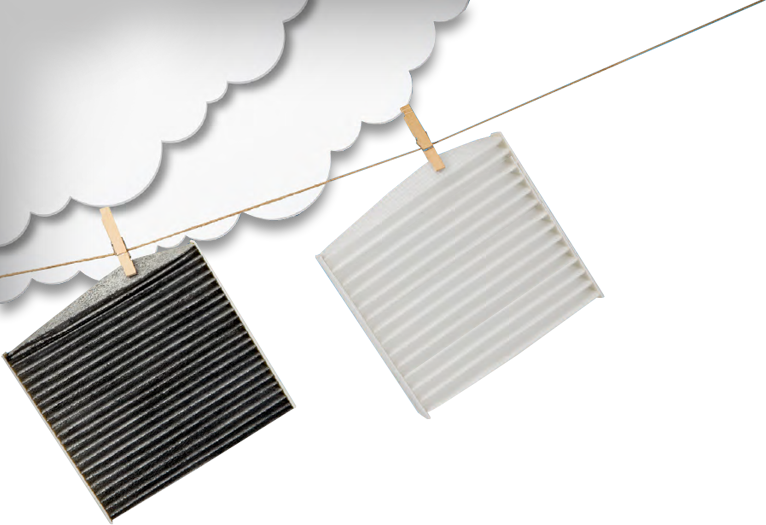 Reduce airflow from vents or windows that fog in FRESH mode indicate that you may need a new cabin air filter. 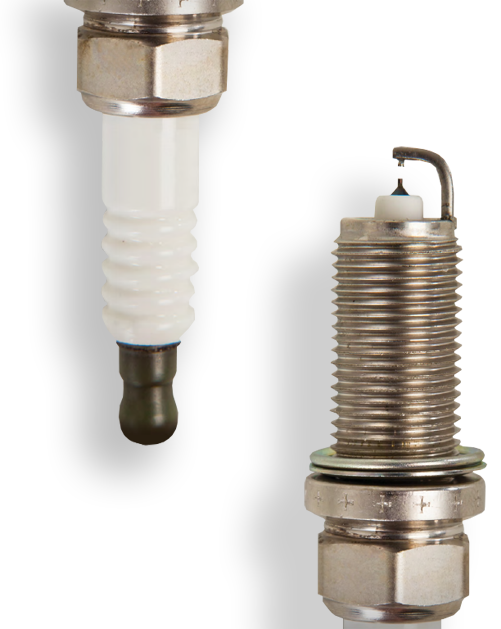 Help your vehicle maintain optimum fuel economy and engine performance by replacing your spark plugs as recommended. Double Platinum Spark Plugs – deliver a strong spark for smooth idle and optimum performance (service life of up to 60,000 miles). Iridium Spark Plugs -promote higher performance (service life of up to 110,000 miles). Consult your Toyota Service Center to find out which spark plugs are available for your vehicle. 10% of Genuine Toyota Spark Plugs have been successfully tested for firing. When it comes to your brakes, don’t settle for a one-size-fits-all solution. Genuine Toyota Brake Pads are engineered specifically to work with the braking system of your vehicle, helping ensure maximum stopping power while sustaining minimum wear. Brakes should be inspected regularly to ensure they are in proper working order. 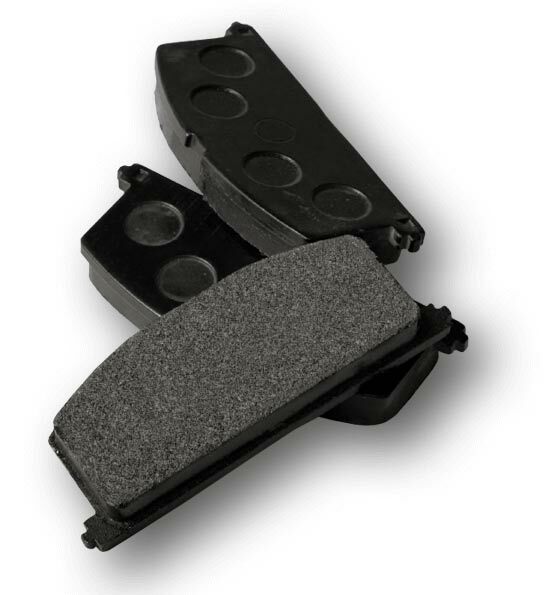 Toyota brake pads have ceramic pads, which help minimize dust, keeping your braking system cleaner. 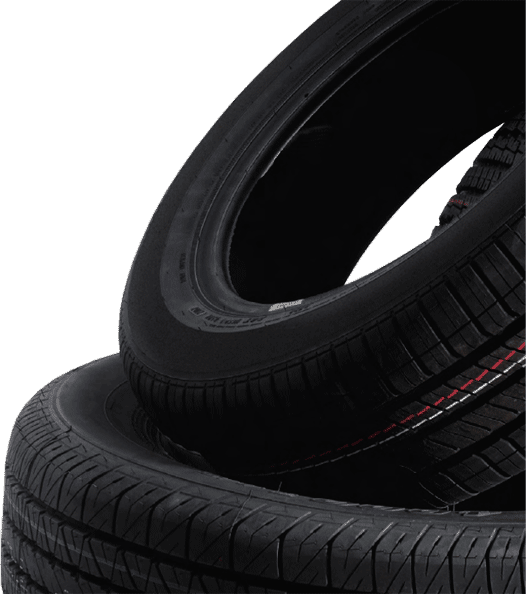 Tires¹ play an important role in your vehicle’s handling, performance and comfort and can impact fuel efficiency. Make sure to keep your tires properly inflated and use tires that match your Toyota vehicle’s specifications. Your local Toyota dealer can help you determine the best tire for your vehicle. ¹Tires are not a Genuine Toyota product. Genuine Toyota Wiper Blades are designed to glide smoothly across your windshield to give you a clear, streak-free wipe. Over time, wiper blades deteriorate, leading to poor visibility and affecting the safety of driving in certain conditions. Use Genuine Toyota Wiper Blades for better visibility, precise fit and easy installation. 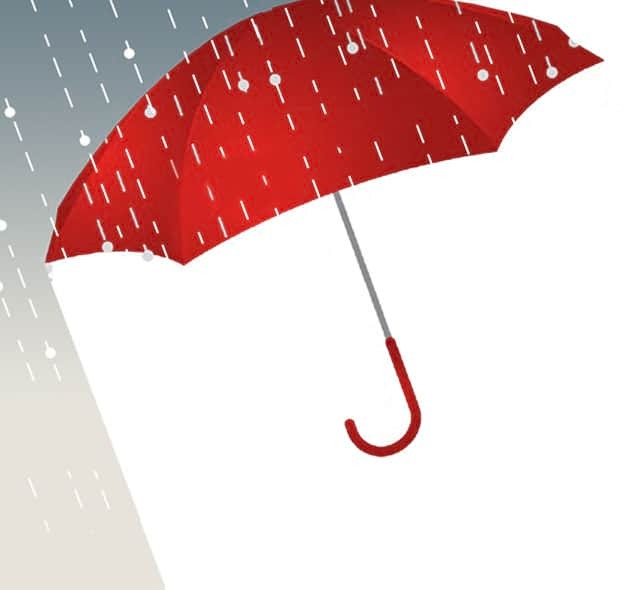 Toyota wiper blades should be inspected or replaced every six months or 6,000 miles. If your wiper blades squeak or leave streaks across your windshield, it may be time to replace your wiper blades. 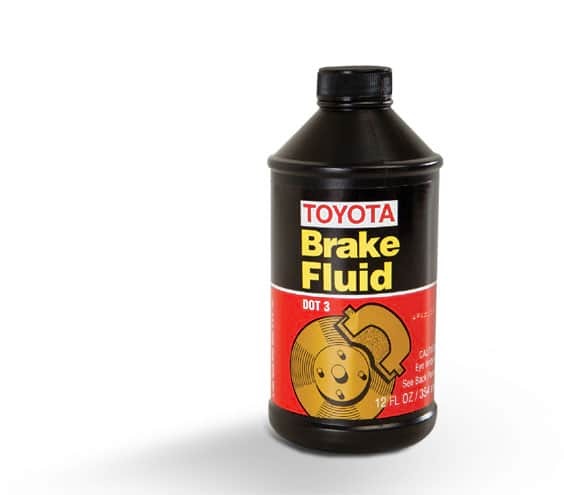 Genuine Toyota Brake Fluid is formulated for Toyota brake and hydraulic clutch systems. It has a high wet boiling point – reducing the possibility of vapor lock, which can cause brakes to soften once brake fluid boils. Special additives help prevent leakage and corrosion, both major contributors to braking pressure loss. Your vehicle’s brake fluid levels should be checked during regular service maintenance visits. Get rid of the grimy build-up on your brakes that can cause squealing and chatter. Genuine Toyota Brake Cleaner is a powerful grease solvent that is used to clean the brake system during brake pad replacement or repair. It dries quickly and without any waxy film or residue. 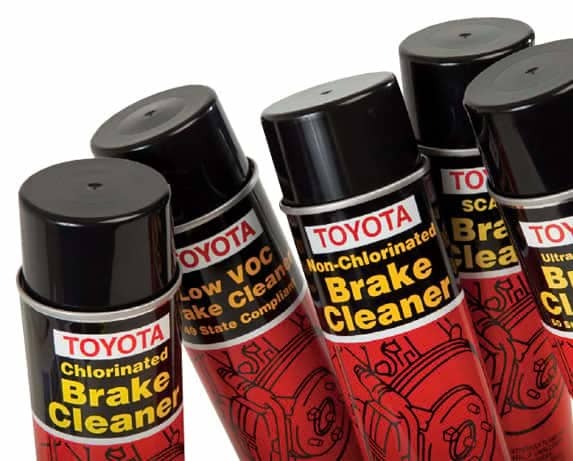 There are five different Genuine Toyota Brake Cleaner formulas to meet various regulations and specific state regulations. Clean surfaces are essential for optimum braking performance. Regular clean of build-up with Genuine Toyota Brake Cleaner. 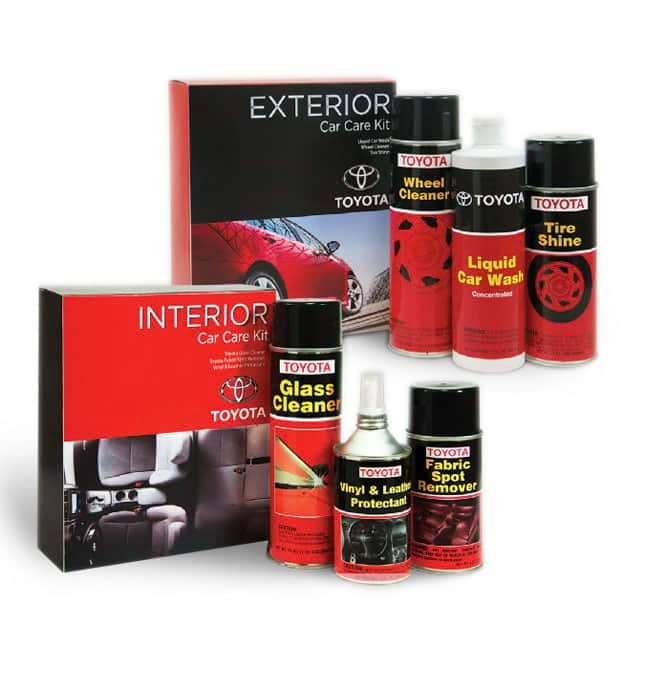 Offering everything you need for a sparkling car in one handy set, the Genuine Toyota Car Care Kit Exterior will help you keep your car clean from top to bottom. Liquid Car Wash: helps remove dust and abrasive particles, leaving your Toyota with a brilliant shine. Tire Shine: for use on rubber, plastic, and vinyl. Wheel Cleaner: made with a water-based detergent/dispersant combined with surfactants that effectively remove even the toughest dirt. Beauty on the inside is just as important as beauty on the outside. That’s why we put together the Genuine Toyota Car Care Kit Interior. Glass Cleaner: for glass, chrome, and vinyl surfaces. Fabric spot Remover: formulated to remove stains without damaging your fabric. Vinyl & Leather Protectant: Like sunscreen for your vehicle’s interior, Genuine Toyota Vinyl and Leather Protectants guards your vehicle’s interior from damaging ultraviolet rays. The sun’s ultraviolet rays are a huge cause of faded and cracked vehicle interiors. Coolant is essential for maximum engine performance and cooling system protection. 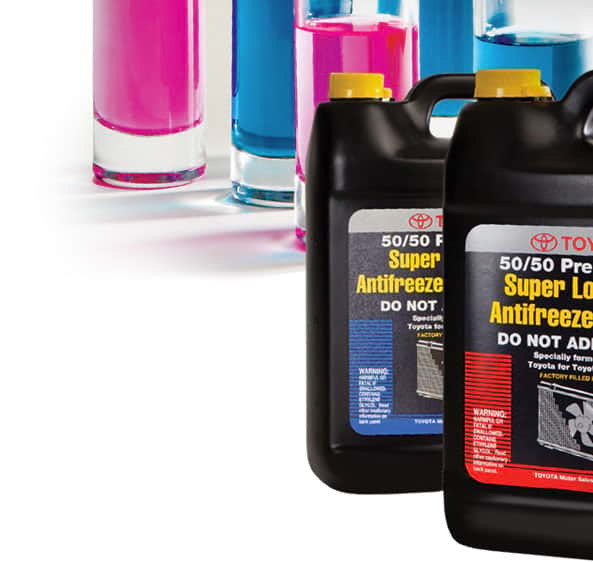 Genuine Toyota Long Life Antifreeze Coolant and Super Long Life Coolant are formulated to help extend coolant life and to provide maximum corrosion protection for Toyota vehicles without the use of silicate or borate. Ask your Toyota dealer which Genuine Toyota coolant is recommended for your vehicle. Check your coolant – when the engine is off and the vehicle is cold – as often as you check your oil. 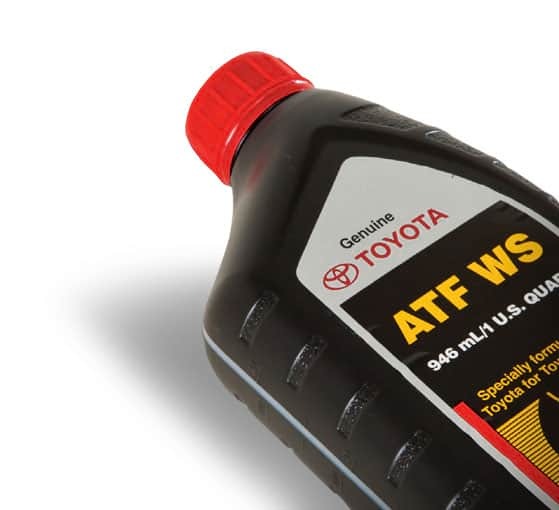 Genuine Toyota Automatic Transmission Fluid is especially made to lubricate the gears and sliding surfaces in your transmission, giving your superior shifting and fuel economy. It also acts as a hydraulic fluid, transferring power and absorbing heat. It contains premium additives with enhances cleaning and anti-wear properties – all to keep your transmission in top shape while helping you maximize your vehicle’s performance.